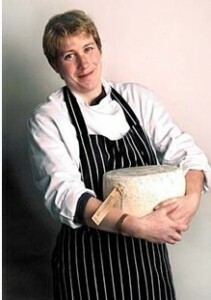 On October 28, 2009, Kate Arding led a discussion on her career in the cheese making industry and a tasting of some regional cheeses. Now an independent dairy consultant specializing in small scale cheese production, Kate has worked in the farmhouse cheese industry for 18 years . She is also a co-founder of Culture, the acclaimed first national consumer cheese magazine launched in December 2008. A native of Britain, She started her career as wholesale manager for Neal’s Yard Dairy in London, where she developed extensive knowledge – and love – of the farmhouse cheese industry, then moved to California in 1997, to help establish Cowgirl Creamery and Tomales Bay Foods. Since 2003 Kate has worked as an independent consultant focusing on affinage (refining of a cheese), sales and marketing, and helping small-scale cheese makers adapt to changing market demands. The event was co-sponsored by The Cheese Club at Cornell and the SHA/CIA Alliance.